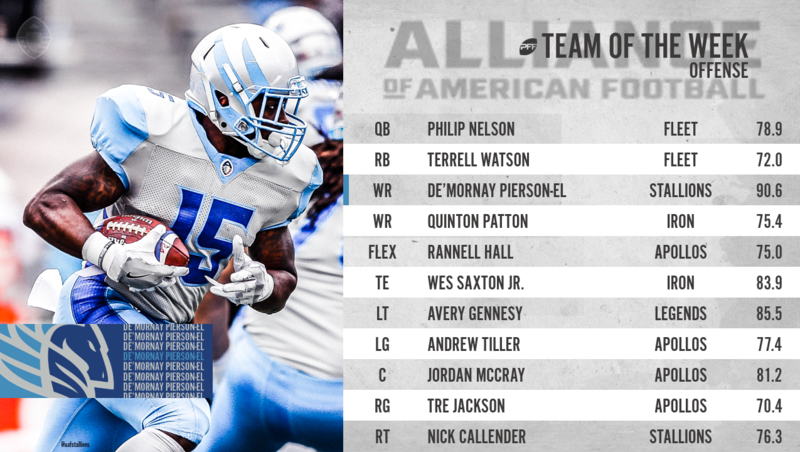 The third week of action in the Alliance of American Football’s first season is in the books, as are our grades for every player on every play of every game. Mirroring our Team of the Week from the NFL side of things, this season we’ll award players to our team of the week in an attempt to shed light on the top performances from the previous weekend’s slate of action. The team format will match the All-Pro system when it comes to offensive and defensive formation, with a flex player for both sides of the ball that can be either a receiver, slot weapon, tight end or running back on offense, and anybody in the defensive secondary on defense. This gives us the flexibility to reward the player that best deserves it across multiple positions, rather than shoehorning in somebody just to fit a slot receiver or cornerback role. We lend some weight to playing time, and a variety of factors are considered, but these will largely be the best-graded players at their respective positions throughout the league. Nelson led the Fleet to their second consecutive win, toppling San Antonio in impressive fashion. Nelson was sharp and accurate, averaging 7.7 yards per attempt while completing 17-of-25 passes. Perhaps his best work came when the offense needed to keep the chains moving as he threw for 11 first-down completions and two more touchdown passes in the victory. Sure, Trent Richardson scored three times and Ja’Quan Gardner went over 100 yards but it was Watson who was more impressive on a per-carry basis. Richardson averaged just 2.7 yards per carry while Gardner ran the ball 12 times for 122 yards but taking away his long of 83, managed just 39 yards on 11 carries. Watson, on the other hand, gained 10.7 yards per carry and had four runs go for first downs and two more that went for at least 10 yards. He broke tackles at will, tallying four forced missed tackles and gained a whopping 57 of his 73 yards after contact. Pierson-El was a big reason the Stallions got their first win over the previously undefeated Arizona Hotshots. He turned nine targets into nine receptions that went for 92 yards but his real work was done after the catch. He broke three tackles after the reception and racked up 62 yards after the catch. His 62 YAC yards were more than all but three other receivers had total receiving yards in Week 3. Patton didn’t get in the end zone but he did find success working the short-area passing attack from Luis Perez for Birmingham. Patton hauled in four passes, each of which moved the chains, and saw a 115.0 passer rating when targeted. Hall’s acrobatic touchdown grab on a 4th & long play from Garrett Gilbert was the highlight moment of the evening for the Apollos as Hall secured four receptions for 68 yards and a score. He sported a robust 144.4 passer rating on his targeted passes. Saxton hauled in three receptions for just 27 yards but moved the chains twice in the process. It was his work in blocking for the run that lands him here, however. He spent a whopping 27 snaps on run plays and finished with the second-highest run-blocking grade among tight ends. Another week, another spot as the left tackle of the week, Gennesy is making a name for him in the AAF. He’s become a stalwart in both pass protection and in blocking for the run, seeing season-highs in both not to mention overall grade this past weekend against Birmingham. For the first time this season, Kitt O’Brien is not our left guard of the week, a spot now occupied by Orlando’s Tiller. He dominated in pass protection, reaching a season-high 88.4 pass-blocking grade, which is the highest from any guard in any week this season. McCrary fielded the league’s highest run-blocking grade among centers, by over 13.0 grade points while he allowed just one pressure on his 34 snaps in pass protection. It’s an interior offensive line sweep for the Apollos as their guard and center trio land firmly on our team of the week. Jackson was excellent in pass protection, giving up just one pressure on 30 pass-blocking snaps. Callender played just 28 total snaps in the Stallions victory but was dominant across the board. The majority of those were played in pass protection, where he didn’t allow a single pressure on 19 pass-blocking snaps. Johnson blew by offensive linemen at will, recording six pressures on his 23 pass-rushing snaps. He got to the quarterback twice, recording two QB hits and was a menace against the run as well, recording three defensive stops. Warmsley didn’t record a pressure in the passing game but he was absolutely dominant up front for Memphis against the run. He recorded five total tackles and both solo tackles came as a defensive stop. While he was strong in run defense, Sayles was a force against the pass for the Iron in Week 3. On 38 pass-rushing snaps, he brought in six total QB pressures including a sack and three additional hits on the quarterback. Newberry edged our fellow Express linemen Jamichael Winston, as he racked up three tackles and a defensive stop in the process. On just 13 pass-rushing snaps, Newberry also got home with a pressure in perhaps a performance that will allow us to see more of Newberry moving forward. Tarpley’s pick-6 was the exclamation point on a dominant performance by the Fleet but that barely sums up Tarpley’s impact in coverage. In fact, he saw three targeted passes and actually held receivers to negative yardage on throws into his coverage. His prowess against the pass more than made up for his three missed tackles and lackluster run defense this weekend. Martini also secured an interception, like Tarpley, except Martini was solid across the board. He missed just one tackle on nine attempts and made five defensive stops against Arizona. It’s another Apollos cornerback listed here, it’s just not Keith Reaser for the first time this season after he exited with an injury against Memphis. Riggs was targeted four times on the evening, allowing just one reception for nine yards. He made a pass breakup and sported a 39.6 passer rating on throws into his coverage. Coleman was strong against San Antonio, in fact so strong, that he spent 24 snaps in coverage and wasn’t even tested. His coverage skills not put to the test, he was in great position all game and forced Commanders quarterbacks to look elsewhere for completions. If one person has made a name for themselves this season on defense, arguably the loudest of those names being shouted is Jamar Summers. It was just another day at the office for Summers this weekend, seeing seven targeted passes come his way as he allowed just two receptions for 36 yards and brought down an interception and three pass breakups. His 8.9 passer rating when targeted was the best of the weekend from a CB and for the season, he has now given up just four receptions on 15 targets and has a 0.0 passer rating into his coverage. Smith returns to his spot at safety of the week, having played an outstanding game despite the result for the Commanders. He flew all over the field and was in great position in coverage while he also recorded five total tackles without missing a single attempt. Powell not only broke up the only target thrown his way in the contest, but he also made every tackle attempt look easy. He recorded two solo tackles and for the season has allowed just one reception and has not missed a tackle in his two games.